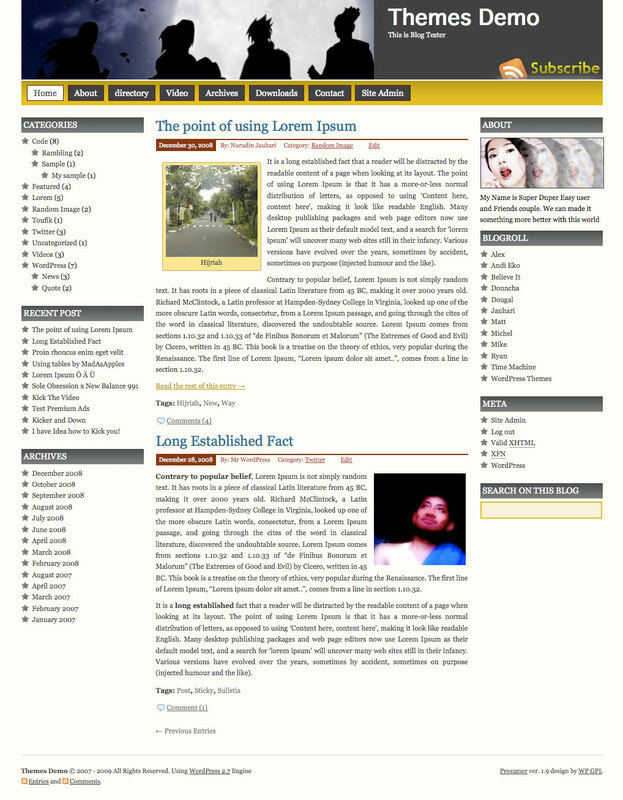 Prosumer WordPress Theme, is popular wordpress theme that develop by Nurudin Jauhari. After long time with Creative Commons license, Nurudin Jauhari decided to move to GPL Licence theme. Because of that fact. Nurudin Jauhari move theme hosting to WP GPL. We hope after Prosumer hosted on WP GPL, this theme will be got more user and better support. Padangan is another 3 columns layout. This theme designed by Nurudin Jauhari and have been use more than 5000 wordpress user. And for better support and community, Theme hosting has been moved to WP GPL. We hove after we move to this server. This theme will be more usable and have more user. I’m working on a blog for a new client and I’ve installed your template. I’m trying to edit the About (you.jpg) photo. They have the free WordPress blog so it isn’t installed on their domain so I can’t just overwrite the you.jpg image with a new one or can I. I’m new to editing WordPress tempates, so if you could point me to the correct place to point the you.jpg to the new one, it would be greatly appreciated. Thanks for your help. Hi, I’m new to WordPress blogs and am working on a client’s site. I successfully installed your template and changed the header image. I’m trying to change the About image. I’m guessing that because this is a WordPress hosted blog, I don’t have access to any directories via FTP. So how do I overwrite the “you.jpg” image with one of my own? Is there a place in the template code that I can change the path to point to a new image? Love the theme and am getting good comments about it. Only problem is that I want to limit the ‘depth’ of the dropdown menu when the cursor hovers over the parent page in the nav bar. Can you help me fix this? I want to limit it to 4 subpages showing. Thanks. Love your theme (Prosumer).. But. I’m getting the js error reported by someone earlier, wondering if there are any fixes? Any help will be appreciated! Thanks. Have you tried to redownload the Themes? Two things: The RSS subscribe button in the header image doesn’t work. Also, the widget heading for an RSS feed doesn’t show up (text color must be set to black or grey). Where do I fix text color, and if the RSS subscribe doesn’t work, how do I get rid of it? Once you start changing the widgets on the prosumer theme, the “About” stock widget, the one with the picture that shows your biographical info in the upper right side bar, disappears. I was able to change the picture so it doesn’t show the stock one. But now I can’t use it, since it disappeared. There is no “About” widget in site admin. So how do I add this back, while still being able to keep the right and left sidebars the way I want them? I don’t (and I think this is the default) have any widgets in â€œSidebar 2â€ in the Site Admin. If you remove all the widgets placed there, does the About section return? Hi Chris, How were you able to change the stock pic under the “About” widget? I’ve been playing around on the dashboard and under my user profile to no avail. I’m trying to find out how to change the Horizontal Menu bar color located under the header. I’ve looked over every page in the editor, but can’t seem to find out how to do this. But one – anywhere in the menus, archive, the list of posts passages highlighted with an asterisk, but only in the widget with comments that do not. How to make and there in the list of comments they shared with an asterisk? Hi Nurudin, glad to fill this comment. I use your themes for my website..very good and very nice. i Can change the header so easy. i Hope you always give update news for these themes.